After two days in Lisbon, we hopped a train to Coimbra, a university town northeast of Lisbon. Lots of history, Portuga oldest university. About two hours by train from Lisbon Oriente, nineteen euros on second class with assigned seats. Nice trains! We arrived at Coimbra B and got a taxi to town, though we could have waited for the local train. We needed lunch! So we dropped our bags at Hotel Vitoria (very nice) and had some small plates in Praca do Comercio. I even bought a three euro sardine-printed tablecloth, which I may regret. But after mackerel and beer it seemed like an excellent idea. Pasteis de Tentugal, sweet filo-like dough stuffed with egg custard. 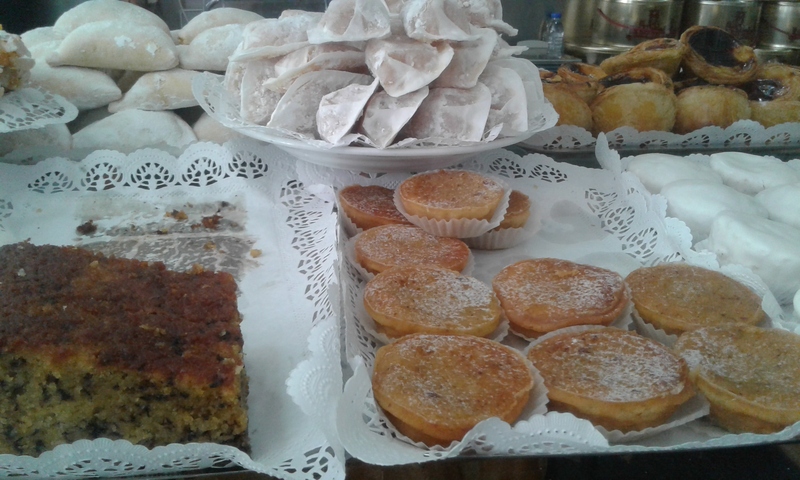 We asked the tourist office about all the interesting pastries, and they told us that Coimbra is famous for convent pastries. More cakes and convent pastries, many with almonds or egg custard. And pumpkin. We sampled quite a few, including pastel de Santa Clara. 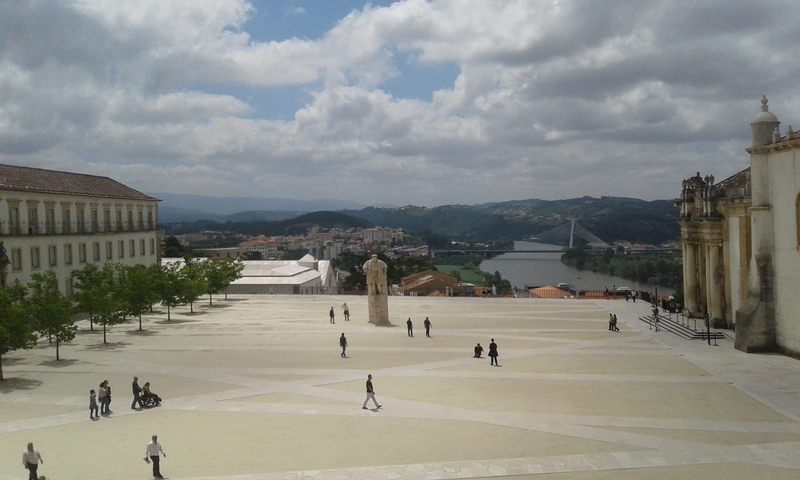 Coimbra is lovely but very hilly, so there were many opportunities to stop for a drink, a view, a pastry shop…. 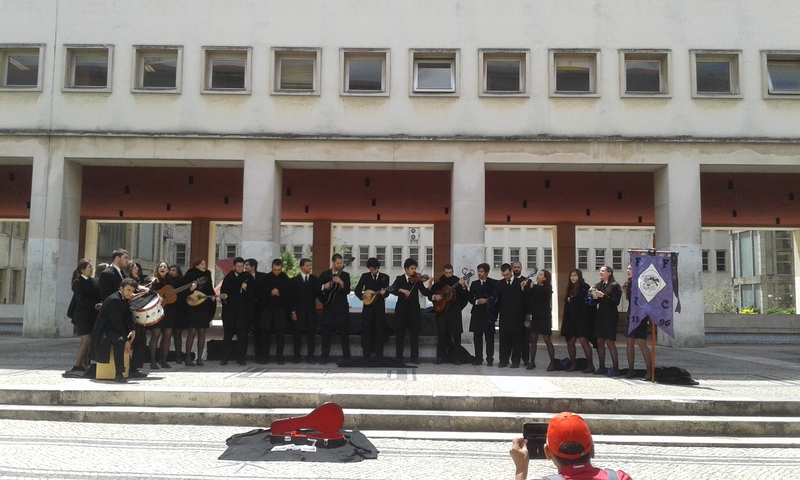 At the University of Coimbra. Amazing library (Biblioteca Joanina) and wonderful buildings. We saw students in black robes, with colored ribbons to indicate their faculty. Doorway. Lots of interesting wall paintings as we wandered down steep little roads back to the lower part of Coimbra. Anither bakery! 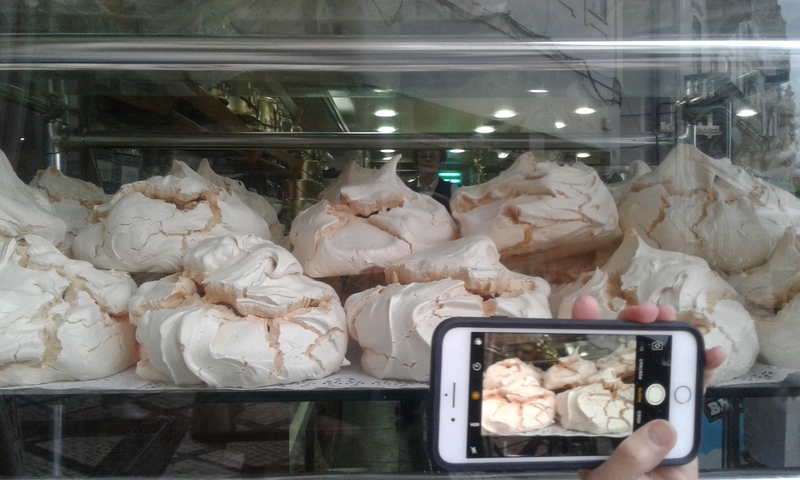 With the biggest meringues (suspiros) I have ever seen. Head sized. The other cellphone is there for scale. 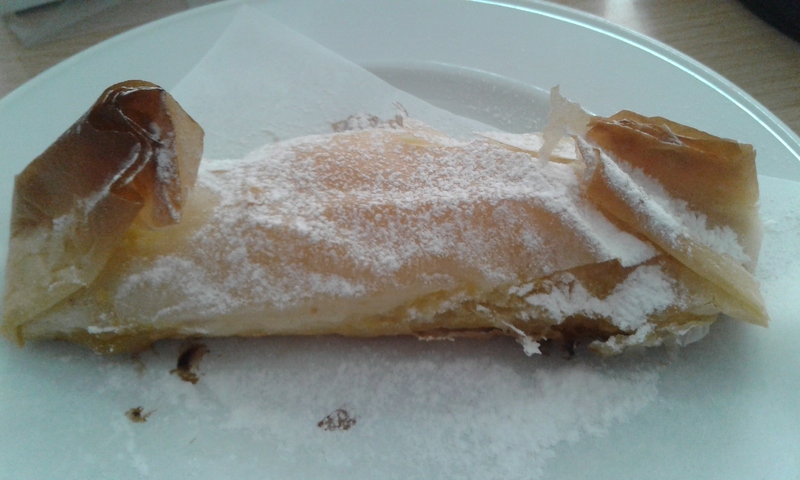 This is at Pastelaria Briosa. Being tourists, we also went to dado. 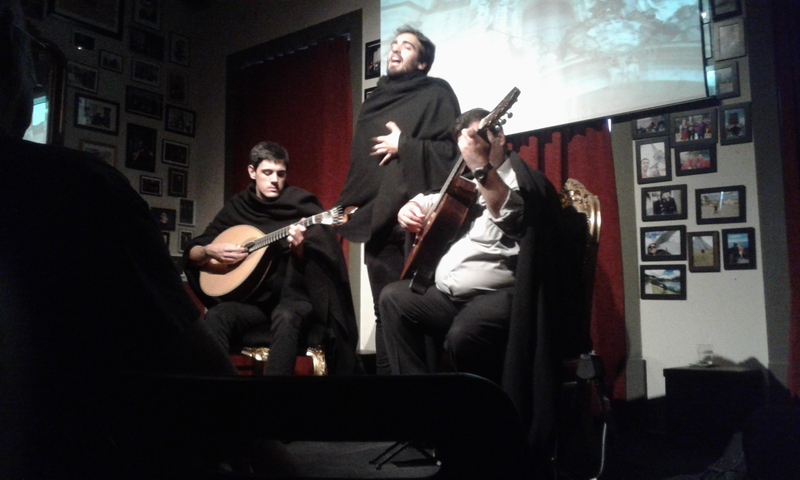 In Coimbra, fado is only sung by men, unlike in Lisbon. We enjoyed this, and will have to try again in Lisbon to compare and learn more. 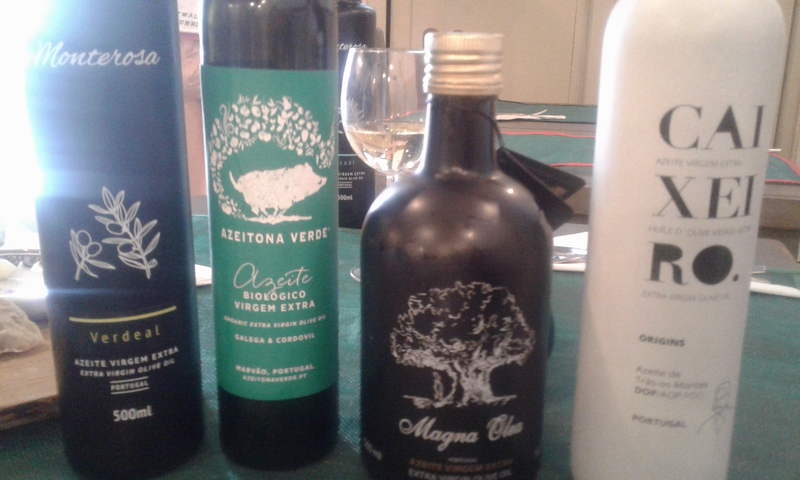 Also learn more, olive oil tasting at Passeite, Taverna do Azeite. Very enjoyable, I never knew much about Portuguese olive oil. Lovely food too, even vegan! Definitely recommended. But onwards we go, and Porto is the next destination. It is lovely being in Europe (window shopping! No chickens in the street! Public transport!) So Portugal being so pleasant for travelling is just a huge bonus. Ten days is not enough but we will come back. It is also much cheaper than expected, we are having nice lunches and dinners for 15 euro or less a head. Fabulous food so far. This entry was posted in food, travel and tagged pastry, Portugal on June 6, 2017 by krumkaker. We are in Varese for a couple days, north of Milano, near the Swiss border. 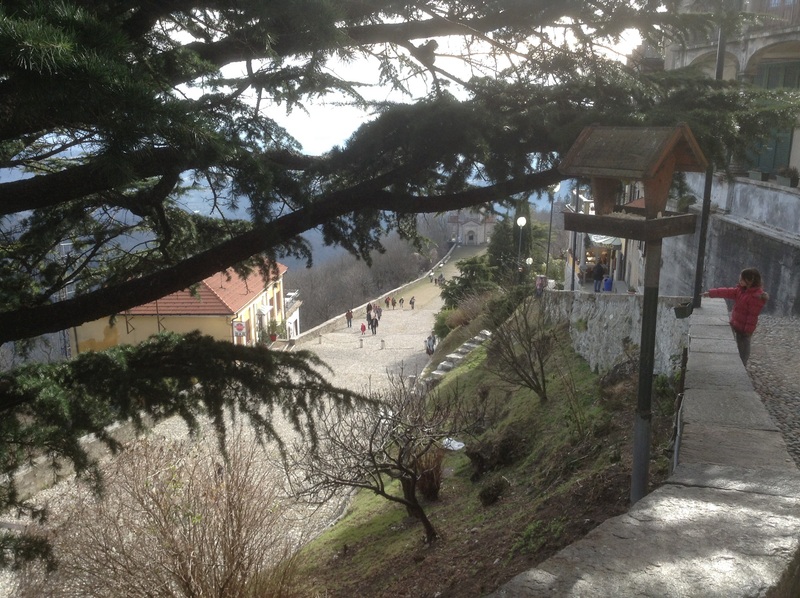 One of the reasons we chose Varese was the Sacro Monte with a mountain walk, the other reasons was the camelli di pasta sfoglia. 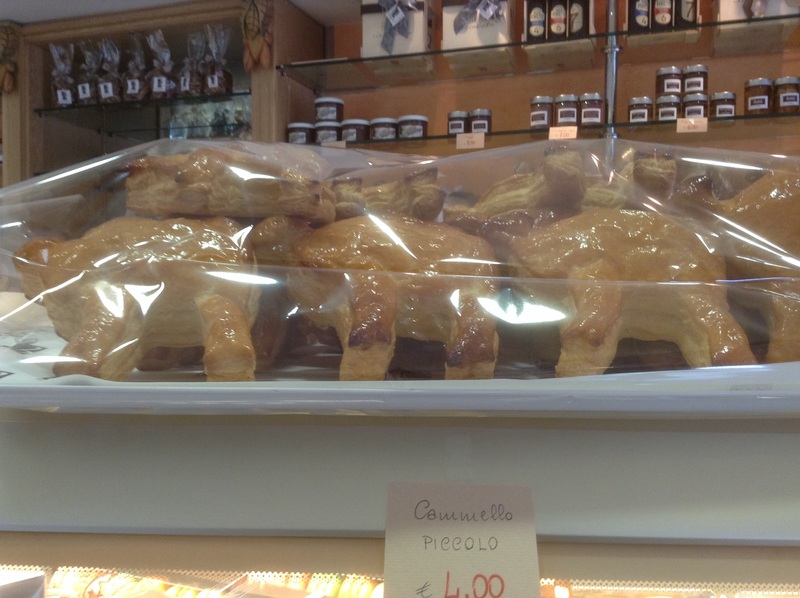 Yes, puff pastry camels, only made in Varese these days before the Epiphany (6 January), in honour of the three wise men. Baked in puff pastry and slightly sugar glazed, they are a very local specialty. So we hopped on the Italo train from Rome to Milano yesterday, then the local train to Varese. Today we went to Sacro Monte. You are meant to walk uphill, past fourteen chapels with the rosary, but not being Catholic or sporty, we just got the bus to the top and walked down. 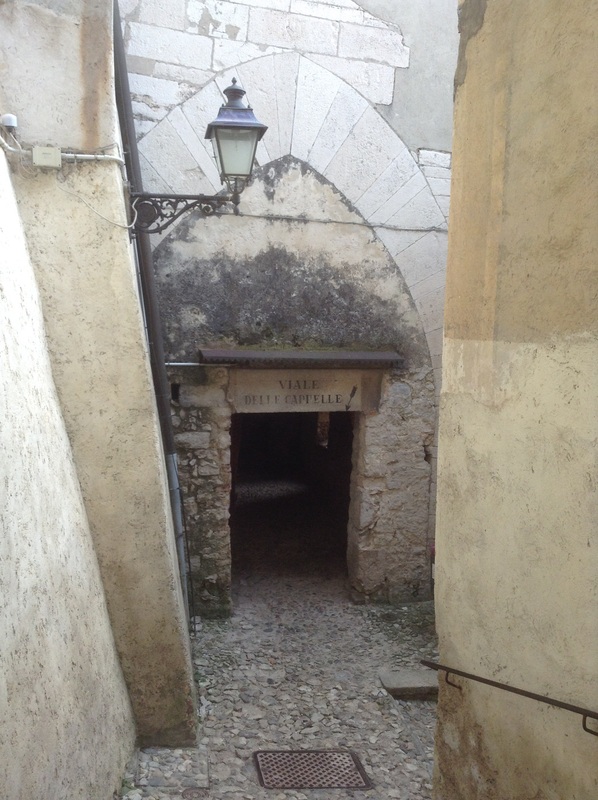 There is a funicular, not always open, so then it is bus C from the centro to Prima Capella (to walk up) or Sacro Monte (to walk down). Lovely day, and lovely views over Lago di Varese and snowclad mountains (some of which were Swiss). Lots of families and dog walkers, it was all rather jolly, though more hilly than mountainous. 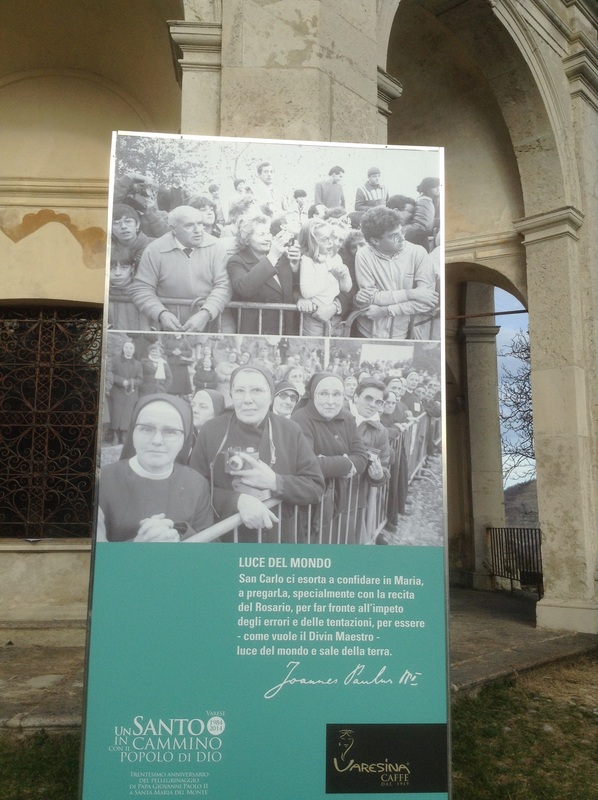 I particularly enjoyed the posters commemorating the 30th anniversary of Pope John Paul II visiting Sacro Monte, with photos of him and of the rapturous onlookers. 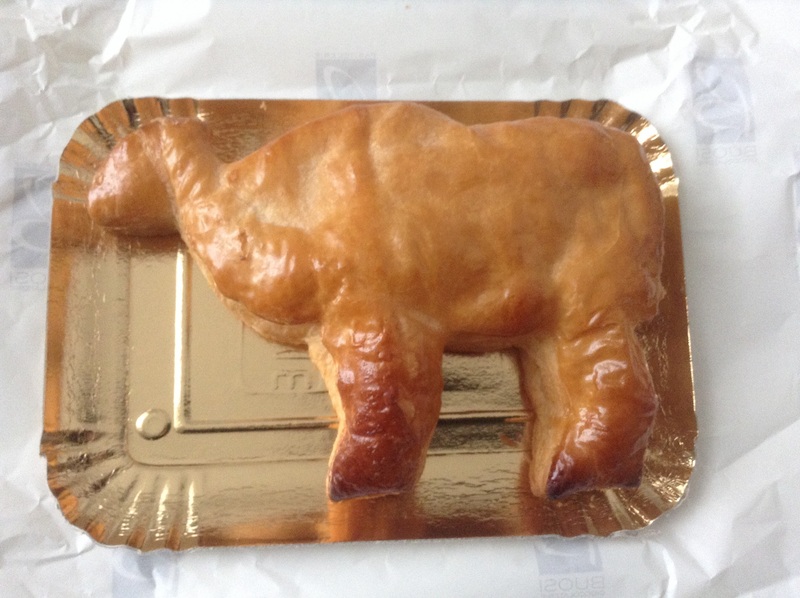 Back in town, I was thrilled to find the legendary puff pastry camels of Varese, only appearing for the days up to Epiphany. And even the small ones are HUGE! We will get some tomorrow to take back to Rome on Sunday, and we bought one for afternoon tea today. I am very curious to try it. 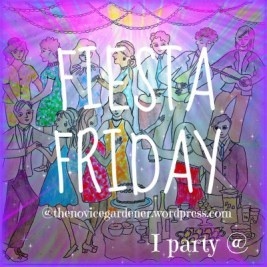 I had forgotten today was Friday…… Two weeks of holidays is wondeful! As we are still on holidays and not at home cooking, I am bringing a tray of these puff pastry Epiphany canels from Varese for Fiesta Friday #49. Happy New Year to all! And many thanks to our hosts Mr Fitz @CookingwithMrFitz, Kaila @GF Life 24/7 and of course, Angie @thenovicegardener. This entry was posted in food, Italy, travel and tagged Fiesta Friday, Lombardia, pastry on January 2, 2015 by krumkaker. 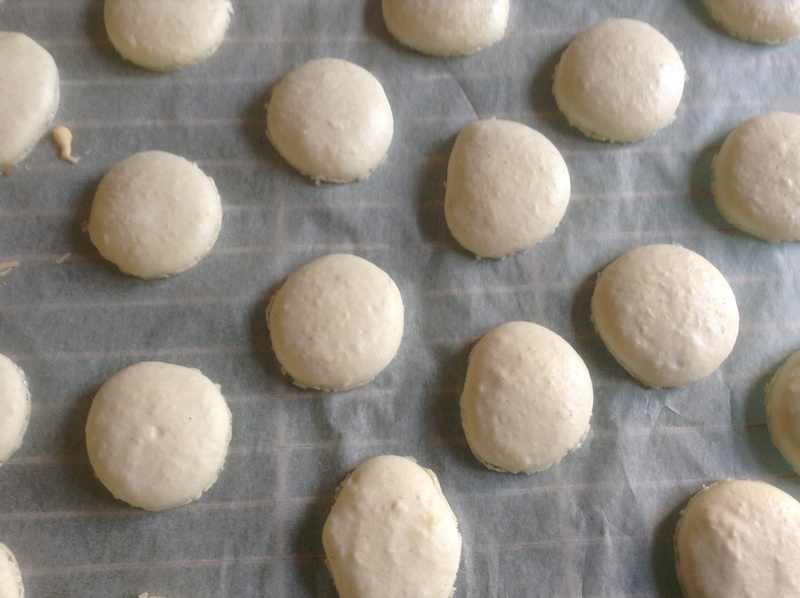 I had a big French exam this summer, and with increasing revision fatigue, decided that making macarons in French must be a good exam prep strategy. I had never made them, but do enjoy eating them, so pourquoi pas? I was baking from a French recipe, which was great. 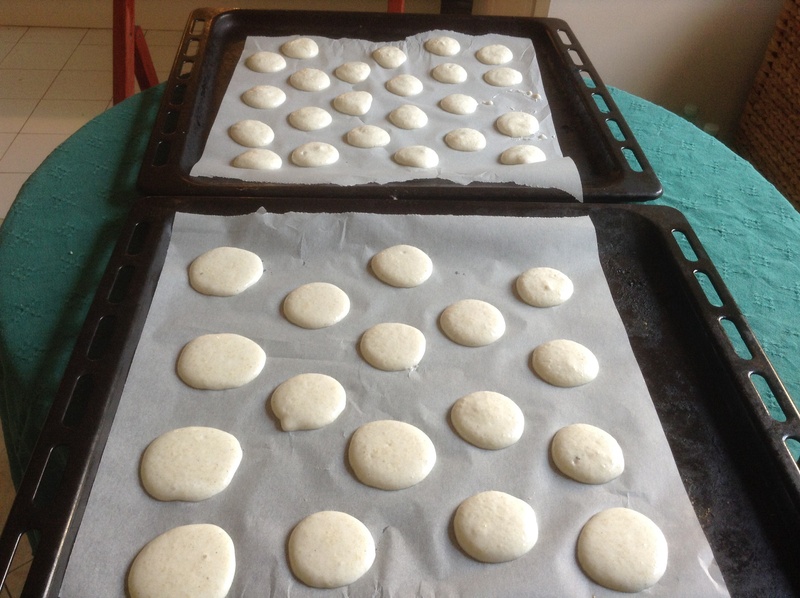 Less easy: the impact of the heat and humidity (la chaleur et l’humidité) of a Roman summer kitchen on the final macarons. But I did have fun making these, improved my French baking vocabulary, and even managed to talk about macarons at the oral exam. Recipe source: Macarons faciles (Ducasse, Serveau 2014). Lovely little ebook, free Kindle version, with 11 recipes and very detailed photographs and descriptions. If you dream about pastry school in Paris, you will enjoy it. Fouettez le beurre! Whisk the butter! When can I work THAT into a conversation? Eggwhites beaten to neige ferme: firm snow. This is for the shells. Mix ground almonds and icing sugar, and mix them them for two minutes in a food processor, to achieve a more powdery consistency. Sieve this. 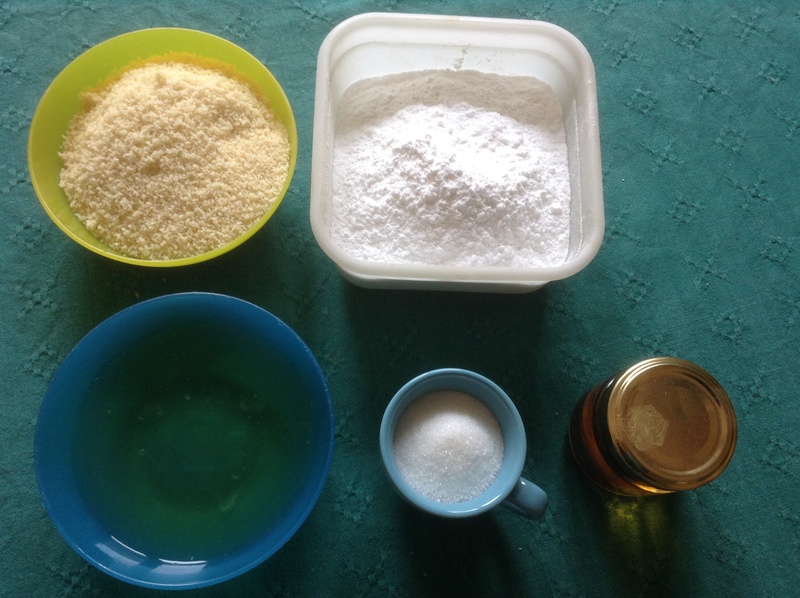 Separate eggs, and whisk 120 grammes of eggwhites stiff, adding granulated sugar little by little. Then add sieved almond/ icing sugar mix, and fold this in with la maryse, a spatula. (I confess, I tipped in the coarse almond bits as well.) Scrape vanilla seeds from pod, and stir well until you have a shiny, supple and liquid mix. Spoon this into la pouche a douille (a pastry bag). I piped these out by hand, and then left them to develop le croutage (slightly dry top, so they do not stick when you touch them) before baking. About an hour, room temperature. You can slam the trays on the table to get the air bubbles out. 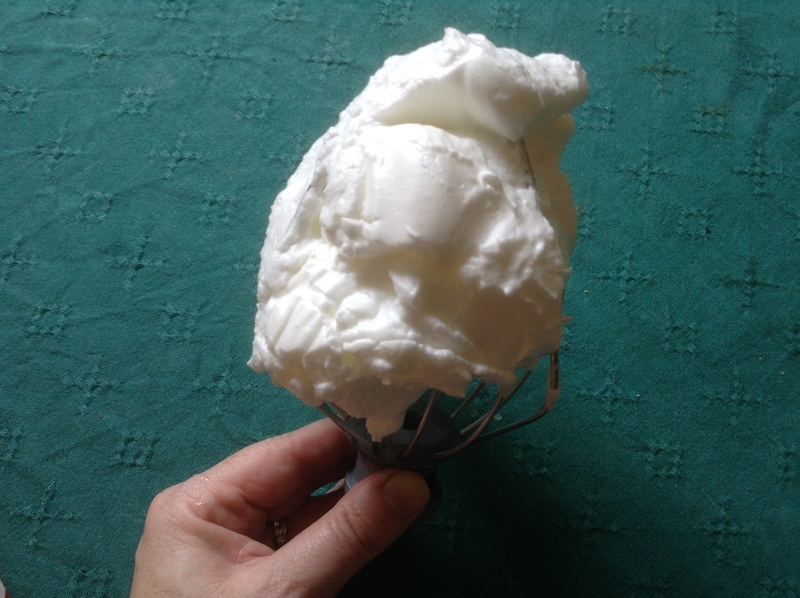 In the interim, make buttercream. Whip the soft butter, yes: Fouettez le beurre! 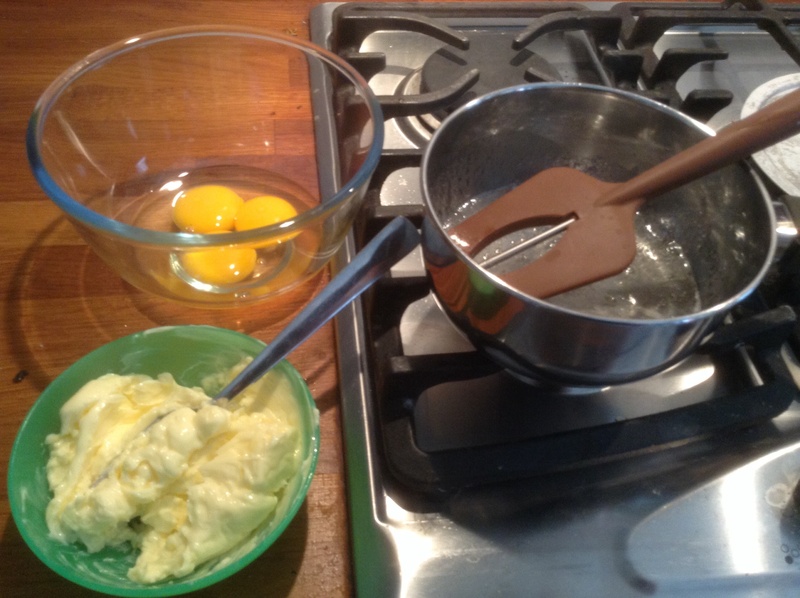 Whisk the egg and two egg yolks. In a casserole, heat the sugar and water to 121C (I had a thermometer to check), then remove from heat. When it is at 110C, whisk the hot sugar and water into the egg yolks, and beat until mixture is tepid, five minutes or so. Now, add butter and fouettez this until smooth. Add vanilla extract. Cool in fridge, if your kitchen is hot. Then bake the shells 12 minutes at 150C, turning the tray around halfway through the baking time. After baking: leave to cool, then remove carefully (lift from below with spatula or such) and move to rack, upside down. Spoon buttercream into pastry bag when ready to garnish the shells. Pipe buttercream on the flat inside, and sandwich with another half shell. Cool carefully in fridge. Not perfect, but not as difficult as I thought. Voila! My first macarons! And I passed the French exam! 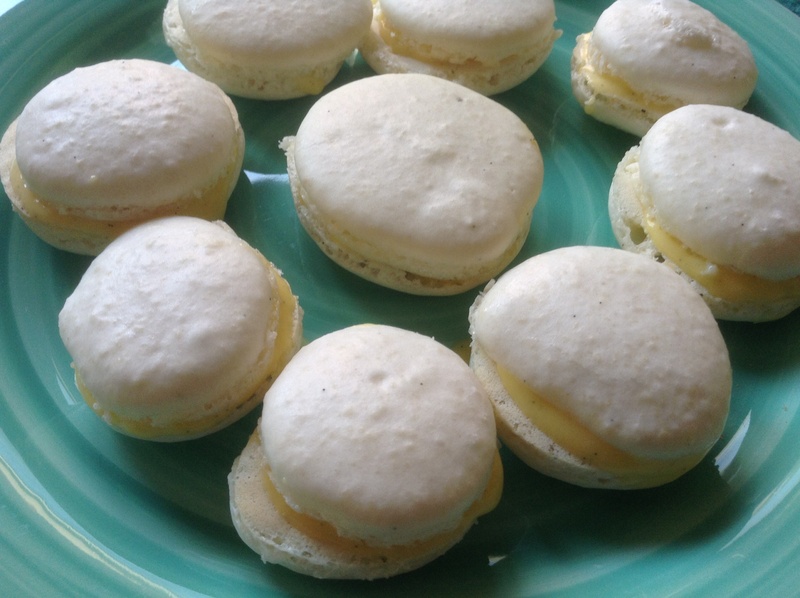 These are thus my contribution to Fiesta Friday 34: sweet little vanilla macarons to share. I am off to browse dishes and mingle. Many thanks to the hosts Angie, Selma and Elaine! Notes: this was meant to make 70 coques, so 35 macarons. Mine were piped out free-form so sizes varied, maybe 30 final macarons? Surprisingly easy though! They still had air bubbles in them, I should have slammed the trays more to banish those. Excellent texture though. I was rather traumatised by the very runny buttercream; even after two hours in the fridge, it was a little too runny. Next time, I will make it earlier. 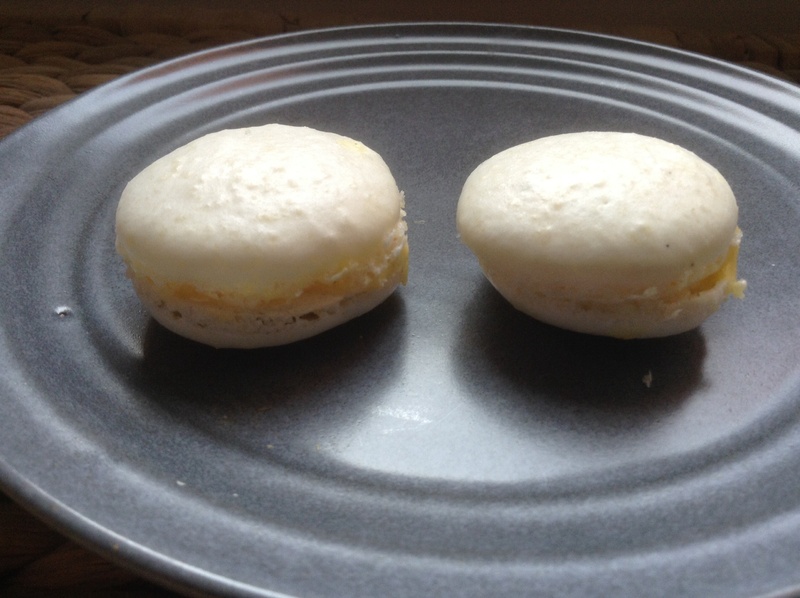 However, we popped the leftover macarons in the fridge and tasted them again for dessert, and they were GREAT by then. Crisp exterior, light interior, and cold buttercream for a sweet firm centre. Maybe they needed a little time to meld (de fusionner). Very sweet, of course, so I might try a tart jam filling next time. But for a first attempt, I was very happy. This entry was posted in baking, food and tagged almonds, Fiesta Friday, macarons, pastry on September 19, 2014 by krumkaker.